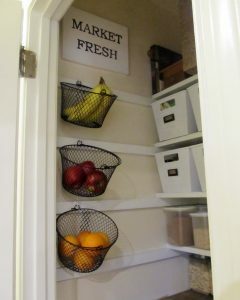 Today, I created a wall mounted fruit basket display in our pantry. I was first inspired by this beautiful wire basket display that I found on Pinterest. I was trying to find creative ways to maximize space in our reach in pantry, and I realized I had a perfect little spot on the side wall of the pantry for hanging baskets. This is almost too simple to need explanation! This little basket display quite literally takes two minutes! 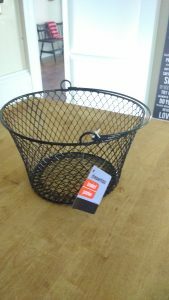 I’m not one to spend a fortune on simple baskets, so I picked up three of these little round baskets at the Dollar Tree. They typically also stock square ones, which would look great as well! Then, I bought these cup hooks from Home Depot to hang them. Just hand screw them into the shelf supports. Measure each hook to be sure it is screwed in alignment. If you don’t have wood shelf supports, you can check for a stud. 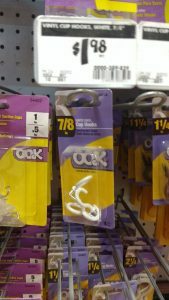 I’m sure there is a way to purchase hooks that can go in with drywall anchors as well. This is a simple little project that I put up while I was cooking dinner. I love instant gratification. 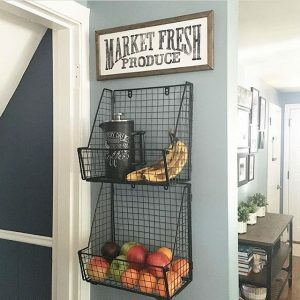 I used a paint pen and scrap wood to make the Market Fresh sign hanging above the baskets. You can see the simple tutorial here. The baskets are from Dollar Tree, and I paid $1.97 for a pack of hooks to hang the baskets. For five dollars, I have a beautiful wall mounted fruit basket display that makes me happy every time I open the pantry door! 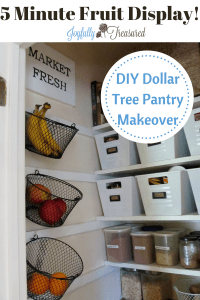 If you like this project, check out the full pantry makeover! Have you done any frugal decorating projects lately?